The Soviet food ethic had certain puzzling aspects, difficult to understand. Meat in gelatin used to be an important part of every festive Soviet meal; but how did anyone enjoy eating it? Although I was born in the Soviet Union and spent the first five years of my life as a Soviet citizen, many things about that era remain largely a mystery to me. I have asked my mom and Granny plenty of questions about life in the Soviet era and have read a great deal about it, but I do not understand many aspects. The Soviet puzzle is made up of some elements I know and understand and some I know of but just don’t understand. ‘Zalivnoye’ meals are a part of the puzzling aspects that I cannot comprehend. Zalivnoye is a way of preparing a meal; fish or meat (tongues were very popular); and the idea is that the fish or meat is first boiled in broth, then the broth is filtered with gelatin added and that liquid is poured over the meal, where it sets and gets all wobbly. Granny says zalivnoye was on every festive table – be it a wedding, funeral, wake or birthday party. “Zalivnoye” is even its own category in the recipe index of the Book. I wonder about many things in the Soviet past: how did families all fit into tiny rooms of communal flats? What was it like to never travel abroad? How was it to queue for hours for food of questionable quality? How could you eat and enjoy zalivnoye??? How can my grandmother, so non-Soviet in her political views and general approach to life be so fond of it? “Your zalivnaya fish is disgusting” is one of the most famous lines in Soviet cinema. I couldn’t agree more. Unfortunately, it’s such a large part of Soviet life, that I can’t avoid it for this project. If it made it to the all-time favourite Soviet movie “The Irony of Fate,” and appeared on every Soviet table, it will have to appear in the Soviet Diet blog. But as well-loved and (relatively) available as fish was in the cities, it was almost never eaten in the villages of central Russia, according to Granny’s friend Galina Vassilyevna. Rural Russians loved zalivnoye anyway. “For big holidays, families would kill a pig and fry it over hay with everyone watching. The kids would always get fried pig ears, it was a real delicacy, which I loved. Then the head and feet were used to make zalivnoye; it was served as the first course with radish spread over it and soaked in kvass. Then we’d serve lamb, schi, milk noodles, millet porridge balls and end with kompot, which we called konpot,” Granny’s friend Galina said. I didn’t quite understand the part about pig feet, but granny says that was no surprise to her. They used to make zalivnoye with cow tails and cow feet as well as pig’s heads and feet. “We wanted to get the same effect that gelatin gives, and while we didn’t always have gelatin, we’d get it from parts of the meat.” Again, what’s wrong with meat not covered in gooey cow tail? Granny, who is staying with me in Tbilisi for a week, had some mercy on me, she knows I’ve never been a fan of zalivnoye fish, and allowed us to roast the fish and then cover it with not cow tail, but agar-based gelatin. This way I could eat and even enjoy it, and we re-watched the famous Soviet movie looking for the fish quote. I think I got a little bit closer to solving that puzzle. One dubious meat part at a time, I may get there one day! 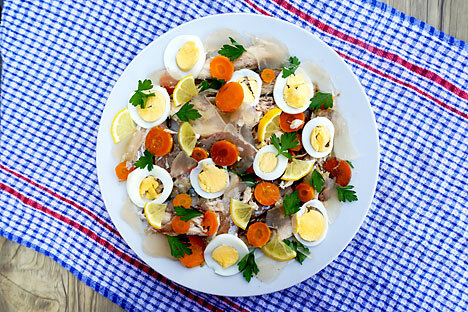 Jellied dishes can be prepared from fish, meat or vegetables. For fish, pike is especially recommended. Jellied meat can be prepared from pork, tongue, veal and all kinds of fowl (chickens, turkeys, ducks, grouse, partridge). Filling can also be made from minced fish and meat: pike, fowl or liverwurst. These products are cut into thin pieces and decorated with slices of egg, lemon, tomatoes, cucumbers, apples, green leaves. For the preparation of jellied dishes from vegetables, use carrots, turnips, cauliflower, asparagus, peas and so on. For the vegetables, you can add fruit (apples, pears, peaches, etc.). Make the broth for the zalivnoye from the fish, meat or vegetables that will be in the final dish. The amount of gelatin to make the jelly needed depends on the strength of the broth. For example, for a broth made from perch stewed with the head and the skin, it is sufficient to add 1-2 grams of gelatin per 1 cup. But for the same amount of chicken broth, add 4-5 grams. For vegetable broth, add 6-7 grams of gelatin per 1 cup. When the broth is ready, boil it for 3-5 minutes, add the gelatin and stir until gelatin is completely dissolved. To get a clear jelly, you need to add 1 beaten egg white combined with a tablespoon of vinegar or lemon juice for every 4-5 cups broth. After the gelatin is completely dissolved, filter the broth through a cloth filter. Let cool slightly, add the prepared foods (fish, meat or vegetables). Peel and chop the fish. Put the fish bones, the head without the gills, root vegetables, chopped onion, salt and 1-2 bay leaves in a saucepan. Cover with water and bring to a boil. After 15-20 minutes, add the pieces of fish. When the pieces of fish are cooked, remove them with a slotted spoon. Put on a dish in the shape of a whole fish, with small gaps in between the pieces. Strain the broth from the saucepan. Add gelatin to it. Boil and strain through a cloth. Put the vegetables on the plate with the fish. Pour the gelatin over the plate. Keep the dish in a cool place until the jelly solidifies. Serve the zalivnoye with red cabbage, potato salad, cucumbers and salt and mayonnaise sauce.